The Playmobil Dino Volcano is complete with a Tyrannosaurus Rex and features an erupting volcano with functional lava stream. The T-Rex has a movable jaw and limbs, and the rocks have hidden fossils. 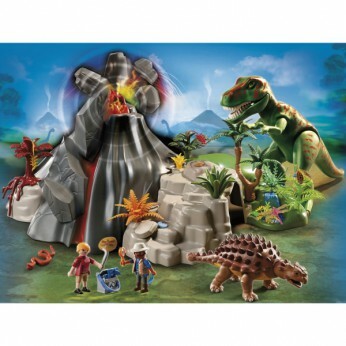 The Playmobil Dino Volcano has been designed to stimulate imagination, improve social skills and inspire your child to explore and enjoy the world around them. Children can build a collection that can be added to over time. One supplied; Size H50, W60, D17.5cm; For ages 4 years and over; EAN: 4008789052308. WARNING(S): Not suitable for children under 3 years old. Only for domestic use. This toy costs approximately £49.99 (for the latest and best prices make sure you check our retailer list for the Playmobil Volcano with T Rex 5230 above). In our review of Playmobil Volcano with T Rex 5230 we classed it as being suitable for ages 3 years, 4 years, 5 years but recommend you check the manufacturer specific advice before purchasing.